Michael Moore, while not the finest or most accomplished documentary director around, is arguably the most contentious and, by extension, the most influential. This is the man, after all, who effectively created the genre of ‘blockbuster documentary’. In recent years, however, his films have come under increasing scrutiny as reports about ‘creative’ editing and outright fabrications began widely circulating, bringing his work into some measure of disrepute for tarnishing the integrity of his chosen medium – a medium which does rely, ultimately, on its fidelity to the facts. Emily Schultz, a Canadian poet and novelist, has ventured into the discussion that continues to blaze around Moore with her first non-fiction work, Michael Moore: A Biography. Schultz adopts the standard chronological approach that is the ready template of biography, tracing the development of Moore’s political worldview from its roots in working-class Michigan to the full-scale electoral intervention intended with his divisive magnum opus Fahrenheit 9/11. She interviews friends and former associates of Moore and does a good job of laying down the bare outline of his early life and career, including a fantastic account of Moore’s brief but memorable stint at the radical countercultural journal Mother Jones. Moore is revealed as a compassionate figure determined to generate genuine social change and leave an impression on the world, but one who in seeking this end justifies means that alienates many of those around him. Unfortunately, Schultz lacks the experience of research and rigour to do more than string together a somewhat perfunctory agglomerate of clippings and previously published interviews. The interviews she has managed to secure for the book are solid but repetitive reiterations of Moore’s virtues and vices, though some wonderful anecdotes are shared by figures involved with his TV productions TV Nation and The Awful Truth. Not having Moore’s co-operation however has resulted in Michael Moore: A Biography seeming a little uneven, with the book feeling the lack of fresh interviews with its subject, and its vocabulary at times seems confusing (the term ‘lefty critic’ seems contextually inappropriate in a work such as this yet is used repeatedly). Multiple uses of the phrase ‘diffuse the situation’ also come across as sloppy proof though this fault may be laid at the editor’s feet rather than the author’s. 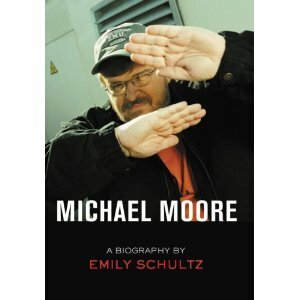 Michael Moore: A Biography is a solid attempt by Schultz at investigating the life and work of Moore, but really is little more than a primer for a much more deeply researched and considered investigation, sure to come in time, of this man who stands at the nexus of politics, celebrity, culture, and truth.